Six Senate Democrats who say they have been frustrated by a lack of transparency throughout Supreme Court nominee Brett Kavanaugh’s confirmation hearing have filed a federal lawsuit requesting the immediate release of records about his tenure as a lawyer for the George W. Bush White House and subsequent nomination as a federal judge. On Monday, as BuzzFeed News reports, Sens. Richard Blumenthal, Patrick Leahy, Sheldon Whitehouse, Mazie Hirono, Cory Booker, and Kamala Harris sued the Central Intelligence Agency, National Archives and Records Administration, and the George W. Bush Presidential Library and Museum over failure to comply with multiple Freedom of Information Act requests for the release of records that document Kavanaugh’s time as a White House lawyer. They are asking the court to force the immediate release of the documents. “The Senate and the American public have a brief opportunity to sift the record of Judge Kavanaugh’s public career before the Senate is expected to make an effectively irreversible decision that would shape the federal judiciary for decades, and the individual Senators have a unique platform to probe and publicize Judge Kavanaugh’s record,” lawyers for the senators at the watchdog group American Oversight wrote in Monday’s filing, per Buzzfeed. The committee sought records from Kavanaugh’s six-year tenure in the White House and records around his nomination and confirmation as judge in 2006. As Buzzfeed reports, “The senators had asked for expedited processing of their Freedom of Information Act requests to the National Archives and the Bush library. 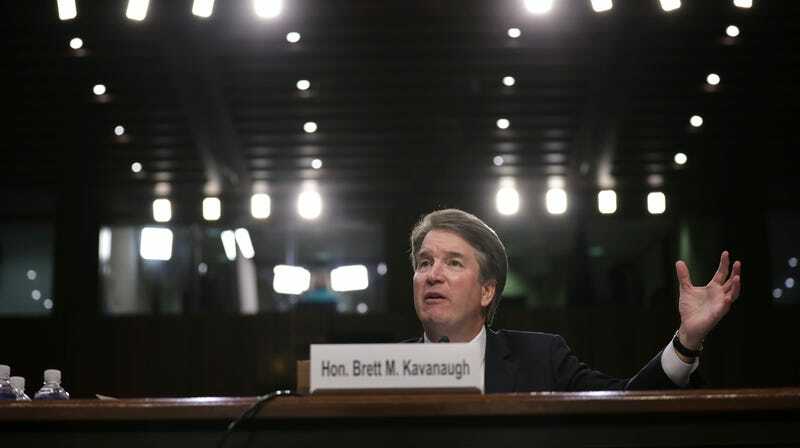 According to the lawsuit, each of the agencies confirmed receiving the requests, but aside from a response from the Bush library about the request for records about Kavanaugh’s DC Circuit nomination, there were no other communications.” The committee requested all additional records by or about Kavanaugh from that time period, including anything he was involved in writing or editing. Under the Presidential Records Act, members of Congress have access to records of former presidents. The Senate Judiciary first sought release of the records on August 8 under a Freedom of Information Act request, which allows agencies 20 days to either approve or deny a request, and 10 days to grant an expedited review request. The National Archives estimated that it would not be able to review all of the documents until the end of October, while the Bush library released a partial set of the documents requested just before Kavanaugh’s nomination hearings began in September. Republicans, meanwhile, are attempting to push Kavanaugh’s nomination through as fast as possible.